Sculpt as you learn about the chemistry of clay. Draw to study stream ecology. Produce a documentary film. Exhibit art pieces to the public. The studio open house for the Rites of Passage program. 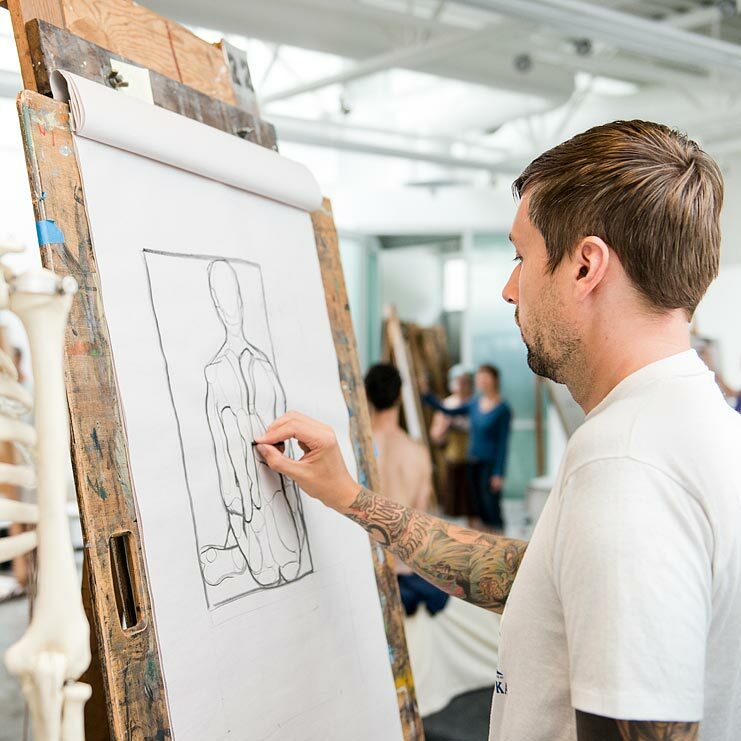 Studying visual and media arts at Evergreen is different than attending an arts school. By setting your study within the context of an interdisciplinary liberal arts education, you will expand your skills in analytical thinking, critical reading, and writing as well as discover themes and ideas that support and refine your artistic practice. Our students apply the theoretical and critical concepts they are learning to a range of artistic practices, from solving design problems to the production of full-scale independent projects. You will not just learn to create art — you will learn to use artistic skills as a means for exploring the vast world of ideas. Join us in an education that doesn’t just change your life — it gives you the tools to change the world. Ready Camera One student Louie Armstrong directs a television interview in the CCAM control room. See below for more information about the CCAM. The root of the word landscape refers to the shape or condition of the land. How do different cultures define and shape landscapes, and how do landscapes in turn shape people and the art they make? We are uniquely situated in the Pacific Northwest to consider a variety of landscapes and seascapes, as well as a variety of cultures with strong ties to both. Your work and learning will be centered in the studio. Projects will focus on expanding 2D skills (drawing, printmaking) and 3D skills (sculpture, craft, environmental art). We will spend time working in the field as well. Field trips and guest lecturers will expand our awareness of regional landscapes, cultures, and artists. View this program in the catalog. Life drawing session in the Drawing Marathon intensive summer class with Shaw Osha. On her first try at feature filmmaking, Audrey Marrs '96 scored an Oscar nomination. On her second, she won. Evergreen alumni artists routinely break new ground, creating original works that change the way we look at art—and the world. From making innovative textiles to reinterpreting traditional carving, photographing rock-n-roll to portraying Antarctica’s rarely seen environment, Greeners continue to add beauty and insight to the world around them. Others make it their business to nurture creative talent and bring it to the larger community. They are graphic designers, documentary film directors, animators and illustrators, fashion designers, photographers, clothiers, jewelers, carvers, and sculptors. Beyond making their careers directly in art, many Evergreen alumni are involved in the arts in other ways, either as artists outside of their jobs or in promotion, arts board leadership, or volunteering. The skills learned at Evergreen — visual and media literacy, presentation and communication, analytical and critical thinking — give students an advantage in their future work. Greeners produced a program comprised of the short documentaries for the program Nonfiction Media: Sustainability and Justice in the television studio. Addison Houston shapes a vase in the ceramics studio. Visual art curriculum is supported by a wide range of studios and facilities for students to experience with and combine a variety of media. Newly renovated art gallery features a cycle of provocative exhibits and installations by regional artists and touring exhibitions. Students of all levels are welcome to borrow film, audio/video and photographic equipment from Media Loan. You can learn how to use this equipment from our staff. Evan Blackwell brings a range of artistic expertise and experience to the curriculum at Evergreen. His artistic practice attempts to draw order and harmony from otherwise chaotic urban environments. Evan's work often imposes elegant design principles onto found materials, scrap wood, manufactured materials, and hardware. His work links aesthetic value with sustainability, and proposes artistic practice and objects as avenues for seeking a personal relationship to urban living. Lisa Sweet has taught at Evergreen since 1999. Her teaching has focused on the function and role of images and objects in the context of religious practices, early Christianity, and the Middle Ages. Her current artistic practice includes two- and three-dimensional works in oil painting, and printmaking in engraving and woodcut.